Someone suggested that I should try this. I've put together an outline for an "Unofficial" Intro to OASYS DVD tutorial. Before I get wrapped up in it, I thought I had better post about it, to make sure that there are no objections and that no one else is doing the same thing. I'll give examples of Vocoding, recording, etc. Aside from direct shots, I will use greenscreen backgrounds and Picture in Picture presentation, to make sure that the viewer can follow every screen and button press. The NTSC DVD would be professionally replicated and region free. Again, if someone has already started this, I'll gladly leave it to you. Otherwise, I will start shooting. Cool ! The suggested topics looks good to me. One thing we know ... this guy knows how to use a camera and shoot a movie ! I'm looking forward to your DVD already! Please don't use the 'UnSteadiCam' approach that was used in these KORG official vids....it REALLY detracts from the valuable contents of the clips. Makes me feel queasy, all those fast swoops and just-not-quite-still-enough-to-rest bits! NOT cool......and hard to watch (IMHO)! I'm sure you've seen them and, have also found the camera motion to be as profoundly disturbing as I did! Well, thank you! I do them. Although I do use quite a bit of motion. But I also try to show static screens and control panels when appropriate, and identify various bits of information with text. Mike, a video would be helpful to a lot of people, I'm sure. Sounds good - if you need some help with the KARMA stuff, let me know. I agree that Stephen's KARMA videos are great, especially the last couple. There is movement, but I find it energetic and not distracting. I will definitely lean towards static shots and cuts. Thanks! That would really help. I'm not trying to tread on ground that you already cover, so I will definitely refer viewers to karma-lab and your videos. 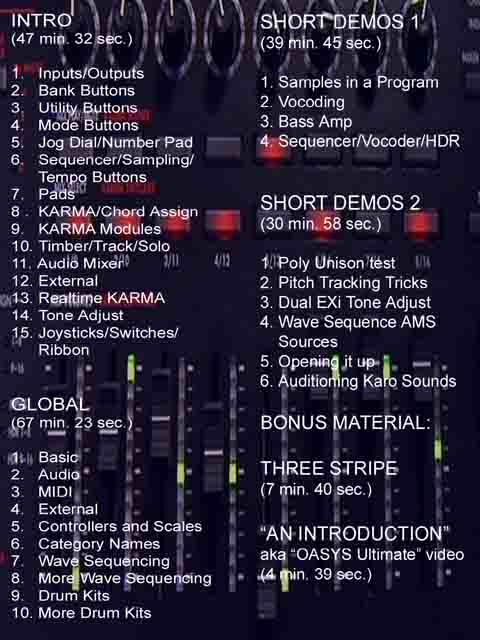 I do want to touch base on how to set up KARMA, within a Program, Combi and Song - all 4 modules and how to zone them, as well as basic setup of the Master, etc. KARMA is definitely an area where I need to better acquaint myself. I'm going through some sections and examining several Programs/Combis. I'll look a bit more and will probably have some questions. I'm sure the DVD would be well done, very useful, and worth the price. Good luck with the project. I will gladly order a copy. This is great news for OASYS owners. 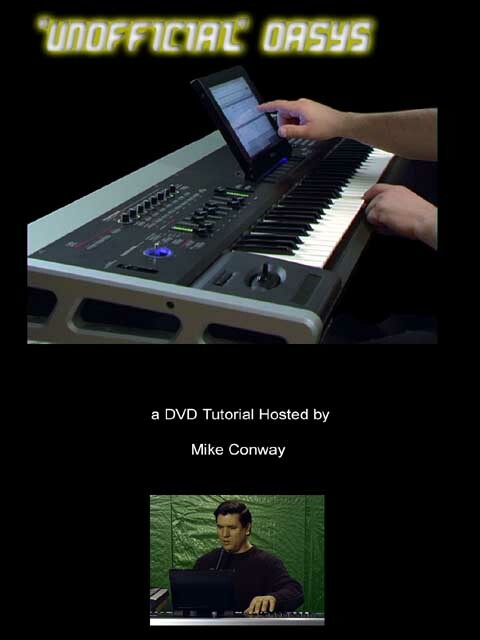 If you are thinking of doing a series of dvd tutorials, I can help with creating a simple 2 module combi with drum and bass GEs operational. Once I get the pdf finished, I'll pass it on to you. I was thinking of doing a set of videos on combi creation, but I'm not really professionally set up for that. So, go to it, friend. PS: I guess you (an a few others) may have missed my post http://www.korgforums.com/forum/phpBB2/viewtopic.php?t=20276 about the bonus combi, "037 Mr. Nice R&B" from ECLECTRIC v 2 for all ECLECTRIC v 1 clients. Send me an e-mail at doubleejprojects@yahoo.ca for the upload. Probably not. I'm picturing a single 40 - 60 minute DVD that will show a few tricks and get people familiar with the main functions of the OASYS. I can help with creating a simple 2 module combi with drum and bass GEs operational. Once I get the pdf finished, I'll pass it on to you. I'm interested in seeing that and might incorporate it. I guess you (an a few others) may have missed my post http://www.korgforums.com/forum/phpBB2/viewtopic.php?t=20276 about the bonus combi, "037 Mr. Nice R&B" from ECLECTRIC v 2 for all ECLECTRIC v 1 clients. Send me an e-mail at doubleejprojects@yahoo.ca for the upload. I saw the post. Thanks, for that. I've just been focusing on a little research. I'll email you. Mike this is a good news and will be welcomed by all Oasys owners. Even though Stephen has already covered so much and did a dam good job at it to say the least, I for one can never have enough video tutorials especially the content you mentioned. I think this is a great idea - I will definitely want to buy one of these - and if you are able to include all of the videos that Stephen did AS WELL...so much the better !! if you are able to include all of the videos that Stephen did AS WELL...so much the better !! No, that will not be the case. Those are Stephen's. I think the content is important and presented well enough, that the Kay videos stand on their own. I will be referring viewers to the karma-lab.com site, which is it's own gold mine. I'm stressing getting to know the basic features (and some not so basic) of the OASYS. A great idea - I hope it will run on European DVD-Players as well! I hope it will run on European DVD-Players as well! Yes, it should. There were quite a few European customers, for THE AWAKENING DVD and they were able to play it. When is the DVD due for release?